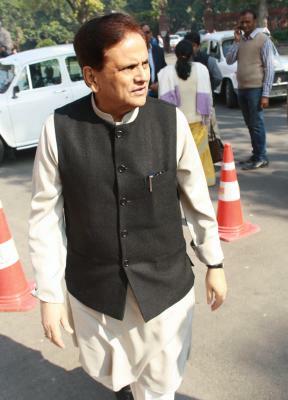 New Delhi, Aug 28 (IANS) Senior Congress leader and party President Sonia Gandhi’s political secretary Ahmed Patel on Monday took oath as a Rajya Sabha member. He was elected to the upper House from Gujarat earlier this month. Rajya Sabha Chairman M. Venkaiah Naidu administered the oath of office to Patel in his chamber in the presence of Deputy Chairman P.J. Kurien, Leader of the House Arun Jaitley, Leader of Opposition Ghulam Nabi Azad and several others. This is Patel’s fifth Rajya Sabha term. Patel won a bitterly fought election on August 9, by defeating his rival Bharatiya Janata Party’s Balwantsinh Rajput, a Congress defector.